Adjacent to the blossoming Mexican plum tree you recently saw in a picture from February 6th were these fungi growing on a dead branch. Mycologist David Lewis says they’re probably in the genus Trametes. the green background makes it so good. Agreed. You may have heard me say a zillion times that the background is as important to a photograph as the subject. What a colossal find! That’s a stunning image. If not colossal in size (which it wasn’t), then happily in its impact on you. I’ve never seen anything quite like it. The structure reminds me of honeycomb, or a wasp nest. Looking at it, I might assume it was as dead as the limb it’s attached to. Alive or dead, its colors coordinate nicely with the wood. I don’t think I’d ever seen anything of the sort, either. Your likening it to a honeycomb is apt in terms of appearance, if not in the distinction between inert and alive. Arithmetical me wondered how many little depressions there are in the fungus but I had no desire to count them. Beautiful patterns in those fungi, Steve. It does look like a bit like honeycomb, or even reticulum. The fungi remind me of reef coral. From a television documentary the other night we learned that Australia’s Great Barrier Reef, which lies so close to Cairns, is home to several thousand species of sponges. And even though I have been to Cairns many times I have yet to visit the Great Barrier Reef. I’m sorry to hear the reef has proved a great barrier for you. Very odd looking. We get lichens, moss, and fungi on our trees here, because it is so wet. Some of our fungi is rubbery too. But nothing we have looks like this! Ours looks more like the the example shown in the article on Wikipedia. Hard and dry. Is this one hard and dry? I think it’s dry and firm, but to tell you the truth, I never touched it. The reason I photographed it is that, like you, I’d never seen a fungus quite like this one. I do usually touch the things I photograph. Somehow I didn’t in this case, but certainly not for fear it would grab me. Greenbrier vines and agarita, on the other hand, have often latched onto me. AKA Polypores. This is the underside, I believe. 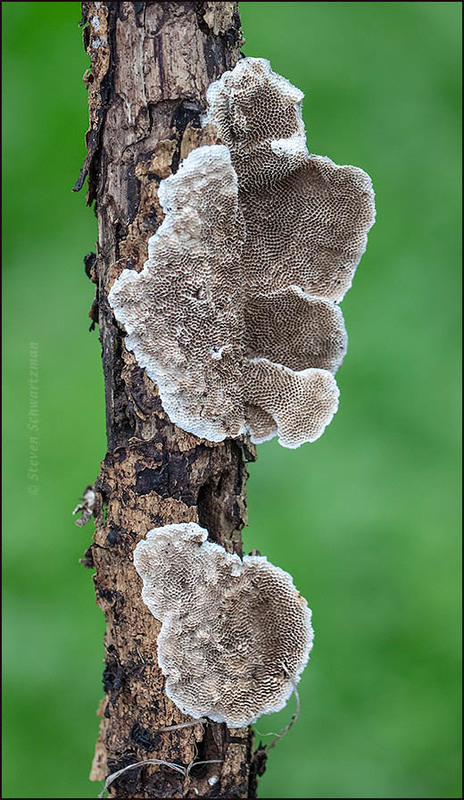 The top might identify them as one of the turkey tails…Trametes versicolor, one of my favorites and quite common here in New England. The word polypore had come into my head after I saw all those “pores” but I didn’t trust myself enough to go with it, given how little I know about fungi: essentially nothing. You’re more advanced. I enjoy finding different mushrooms as well as wildflowers. I am no mycologist, but find them fascinating and so varied in their shapes and forms. Like you, I find their patterns and shapes intriguing, regardless of what they are scientifically. It is so cool to see the web of life in action. To see and where possible to document.